How young is too young to be a Member of Parliament (MP)? In 2012, at the tender age of 19, Proscovia Oromait from Uganda became Africa’s youngest MP and the second youngest legislator in the world. Younger than her is only Swedish MP Anton Abele, elected in the Swedish Parliament in 2010 at the age of 18. After her father, Ugandan MP Michael Oromait, unexpectedly passed away in July 2012, Proscovia decided to run for his seat in Usuk County, in the Katakwi District, a part of Uganda that has been plagued for years by inter-border conflict with neighboring district. Proscovia ran with the support of President Yoweri Museveni’s National Resistance Movement party. With powerful political backing and intense campaigning, she managed to win 54.2 percent of the vote, beating out eight other candidates and earning more than double than the runner-up, and joined a Parliament, where the average age is 62. Her age might be an important advantage, as it could allow her to relate better to the Ugandan population, 78 percent of which is under 30. Some argue that it is her gender more than her age that could cause the young MP problems. While Uganda has a good number of female MPs, 134 out of a total 385, many female parliamentarians complain that sexual harassment is rife. Proscovia has allegedly received multiple sexual advances from several of her MPs, despite repeatedly turning them down. Proscovia had dreamed of becoming a politician since an early age, while watching her father meet with political advisers and constituents. 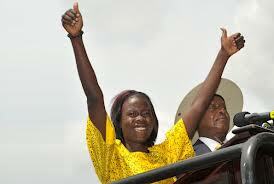 When she was small, she used to say that she wanted to become the president of Uganda. When challenged for her youth and lack of experience, Proscovia emphasizes that what matters is the “brain that one has to fight for the constituents.” She is currently studying for her bachelor degree at the Uganda Christian University in Mukono.